One more white card for this week. At Whoopsi Daisy we are having challenge "Bling It On". I hope you all will play with our challenge. BTW, it's my favorite kind of challenges, because i love sparkles. For my card i used image from sheet #485, and you can find it HERE. I just added light coat of distressing ink, and added lots of Diamond Dust. 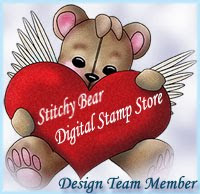 To cut out image i used one of my very favorite Die by Spellbinders. Here is some flowers i made. Some of them from Fabric, and some from Velum. I added Die cut flourish by HC. Also i made pearls string on the fishing line. I really love this card, and will make box to go with it. Some day one lucky Bride will receive this card.